NORTHRIDGE, California – American Idol is the country’s most-watched TV series, and has been the number one show for six years in a row, thanks to its blend of stars in the making, audience participation and the often-unpredictable reactions of celebrity judges Randy Jackson, Jennifer Lopez and Aerosmith’s Steven Tyler. 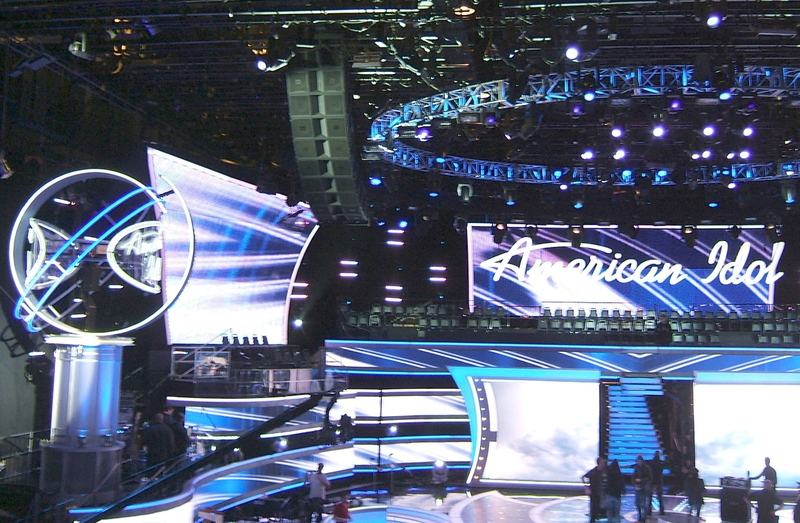 For American Idol’s 2011 season, wrapping up this week, the main house PA and dialogue system has included a total of 300 JBL Professional loudspeakers, including VERTEC® line arrays and Control® Contractor loudspeakers, ensuring the contestants and judges are clearly heard no matter how loudly the audience cheers the performers. The system has been installed in Stage 36 at CBS Television City in Hollywood. The main system has included 20 JBL VERTEC VT4889 fullsize line array elements, and the dialogue system has comprised 275 JBL Control 25 loudspeakers. The system was designed and installed by Patrick Baltzell and ATK/Audiotek of Valencia, California. “The look of the set is a big part of the show, so the audio system could not be visually intrusive,” noted Baltzell. “We needed speakers that could provide full-range response all in one box, without having to use separate subwoofers or high-frequency elements, because we needed to use as few boxes as possible.” The VT4889 line array elements have been set up in two main groups of 10 speakers each, in locations selected to deliver even sound coverage to all 620 members of the studio audience. For the dialogue system, a compact Control 25 speaker (measuring only 9.3 x 7.4 x 5.8 inches) was placed underneath every other seat in the audience. The series’ 2-night grand finale will be staged in Los Angeles’ Nokia Theatre L.A. Live on May 24-25 in front of a theater audience of over 7,000, as well as being broadcast on FOX to millions of viewers watching at home.